Before I start a unit, I identify the skills and knowledge students will need to be successful. I write them as student friendly "I can..." statements. These become my content standards, and I save these in a spreadsheet for later years. I also number them. A few are below. Standard 10: I can specify a series of transformations that carry one figure onto another. Standard 15: I can apply the Pythagorean Theorem to solve a variety of geometric problems. Then, I take my old tests and quizzes and place the assessment items (i.e. questions) into groups based on which of the standards they're assessing. Ideally, I have just enough items to allow me to accurately determine if a student has mastered that standard. Sometimes I have too many or not enough items, and I fix that by deleting some or writing more. For some reason, this often comes out to exactly one page. Below is an example. 7/10 Some Conceptual Errors: you have demonstrated partial understanding, but are unclear on one minor concept. 5/10 Weak Understanding: you have attempted to answer the question, but are unclear about multiple minor concepts, or one key concept. Student should retake. 0/10 No Understanding: You left the page blank or made no mathematical attempt. Student should retake. 5/10 Weak Understanding: Not really. 0/10 No Understanding: Check for a pulse! Well, I've tried grading with the more common 4 or 5 column rubrics, but there is often confusion that a 3/5 means the same as a 60% in a 100-point grading system. That's a battle I kept having to fight with students and parents. However, by grading out of 10, students can easily match their grade up with the A, B, C, D, F format of most schools. I don't necessarily like the system, but I would rather my students not be confused. What's the 10/10 all about? Most standards based grading systems advocate for no extra credit. But, in classes with many different ability levels, teachers often feel the need to give students who go above and beyond some sort of credit. So, the “extra credit” is hidden in the 10/10. Students that demonstrate mastery still receive 9/10, but the challenge is there for students that want it. 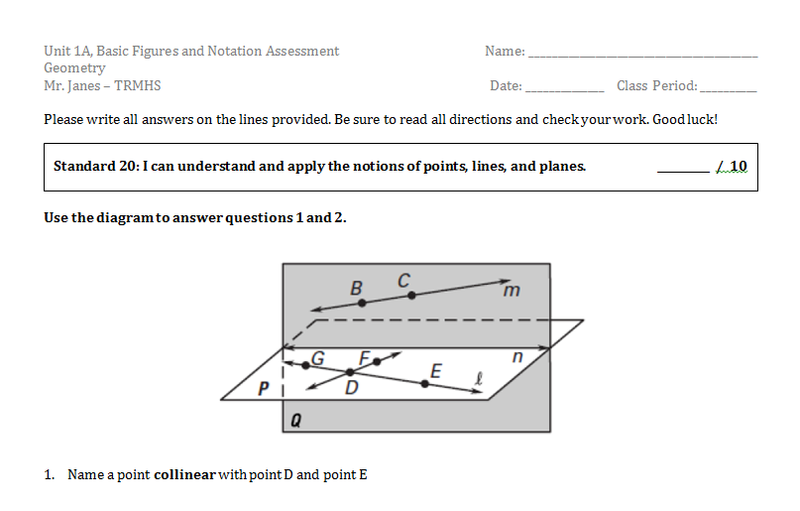 And, if students are unable to get the challenge question, they will still get a 9/10 - not a far way to fall. 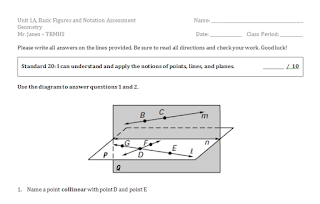 What if a student gets the challenge question, but has mistakes elsewhere? If a student had a minor computational error, but they got he challenge, I write "8+1/10" on their paper. the 8 is for the minor computational error, and the +1 is for the challenge question. They will end up with a 9/10 in the grade book, but I also put a note on the assignment. It's not a perfect solution, but gets the point across. Where's the 4/10, the 3/10, the 2/10, or the 1/10? I allow students to retake assessments. If there is no understanding evident, then I need to strongly encourage the student to study and retake the assessment. I feel giving a 3/10 sends mixed messages to students and takes longer to grade. How much time does it take to grade assessments this way? I have found grading this way is faster than grading by question. That's because I don't perseverate over how many points I am allotting per question. I've also found I give better written feedback because I'm looking at the standard as a whole. How many standards are on one test? The sweet-spot for me seems to be three or four. I once did six, and it took too long. Just assessing one seems like a job for an exit-slip. We do give final and midterm exams, and for those I typically have six to eight standards. So, how do you put grades into the grade book? I put in one grade per standard, so students can see their level of mastery on different standards. I never average together all the standards, and I don't encourage students to do it either. What does this mean for formative assessments? I have started labeling formative assessments, independent practice, and collaborative tasks with wither the "I can..." standards or the number of the standard. That way, students can see how learning activities, formative assessments, and summative assessments all relate to each other. It also helps students find resources when studying or retaking assessments. Do you retest the same standard throughout the year? I reserve the right to retest any standard at any point during the year. In reality, I only retest key standards, ones that constitute the major work of the grade. Our school gives midterm and final exams, and the standards on those have all been tested before.